A woman's lips swelled to twice their normal size after she had mouth fillers at a 'Botox party' in a friend's living room. 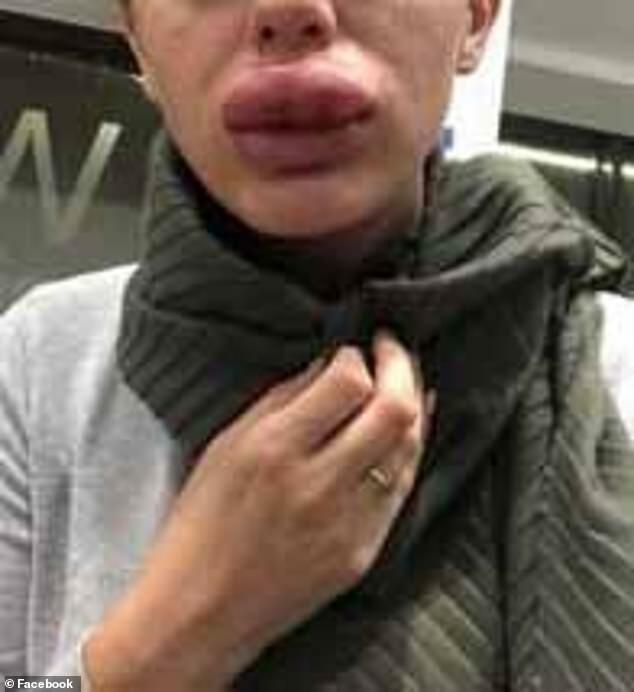 Rachael Knappier, 29, only intended to have the wrinkle-erasing injection in her forehead but, after a few glasses of Prosecco, decided to have her lips plumped at a cost of £220 at the end of August. The beautician mistakenly injected the filler into an artery, which caused her mouth to swell within hours, cutting off the blood supply to her lips. After being sent home from A&E, Ms Knappier, of Leicestershire, took it upon herself to contact a cosmetic-surgery expert, who warned she may lose her top lip if the tissue started to die. Three days later, Ms Knappier was left screaming in pain while doctors injected her lips with a dissolving agent. Three months on, her mouth is almost back to its normal size. Botox and fillers make up around nine out of 10 non-surgical treatments performed in the UK, and are a multi-billion pound industry. Lip fillers cost around £300 at specialist clinics but are available on the High Street for as little as £99. Nikki Milovanovic, a spokeswoman for the British Association of Aesthetic Plastic Surgeons, warned that although it is a prescription-only medicine, many unscrupulous 'practitioners' get hold of Botox online. Legally, fillers can only be injected by a prescribing clinician or under their supervision. But Ms Milovanovic warned courses to inject fillers can take just half a day. Ms Knappier previously had Botox in her forehead and once had a small dose of filler in her top lip to even out a bump she has had since she hit her face against a door as a teenager. Although she planned on getting her lip 'topped up', she did not intend to have the injection at the party until the beautician pointed out the bump on her lip - which Ms Knappier calls her 'weakness'. This combined with copious amounts of alcohol persuaded Ms Knappier to have the procedure. 'There was fizz and cake and it was a bit of a conveyor belt with girls sitting in the kitchen waiting their turn with local anaesthetic cream on their faces,' she told The Sun. Once the reaction set in, a panicked Ms Knappier Facetimed the beautician in distress, who told her to get to A&E. While there, doctors reportedly told her she was not having an allergic reaction and should have the filler dissolved by a beautician. Still concerned, Ms Knappier rang her mother, who suggested she contact the 'non-surgical facial rejuvenation' company Consultant Clinic. The owner reportedly told her it looked like the filler had been injected into an artery, which can kill the tissue if its blood supply gets cut off. With her lips almost back to normal, Ms Knappier said she will never attend a Botox party again and just assumed people who inject fillers have been to medical school. Antonia Mariconda, founder of the Safety in Beauty campaign, is urging the Government to ban non-healthcare professionals from carrying out these procedures and encourages women to seek out medical experts when having Botox.